For those of you having issues with Windows 7's childproofing and can't edit any files. 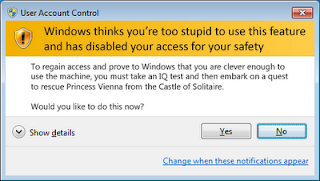 (Eleanor says that Windows 7 inherits its 'attitude problem' from Vista). net user administrator /active:yes into CMD. 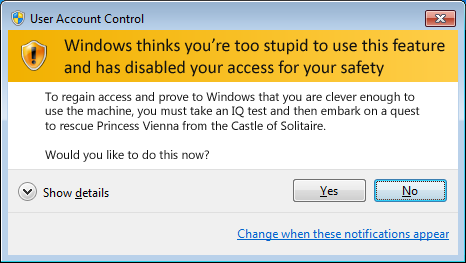 Of course, you'll need to run CMD as an Administrator, after taking an IQ test, followed by going on a quest to get the secret password after saving Princess Vienna before you are allowed to hit the "Enter" key... But fear not, my noble quest goer, once you enable the admin account, you can rejoice in baby-proof free computing. Also, do this at your own risk. Eleanor ain't responsible if you mess stuff up (or get killed by a dragon while you're doing the quest).